This is an A&WMA Ontario Section communication providing important information to our members. For the latest information and goings on in the Ontario Section check out our website at www.awma.on.ca. 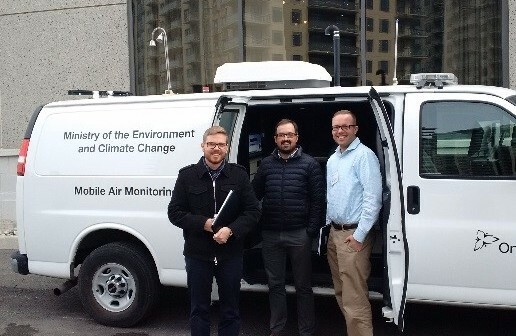 On the heels of a successful and well attended full-day conference on air and noise monitoring this fall, we’re riding that momentum with this Winter 2017 Newsletter. The outstanding calibre of events, information, and networking that we enjoy as part of the Ontario Section and the Ottawa Valley Chapter of the Air & Waste Management Association, flows from the efforts and ideas of our Board of Directors and Officers – who are all volunteers – and also from the input, feedback, and participation of you, our members. As we head into a New Year of breakfast meetings, workshops, conferences and Newsletters, I would like to invite you also to consider attending any of our monthly Board meetings in person or via teleconference; they are generally held on the 3rd Thursday of every month. You can email Brian Bobbie (bbobbie@altech-group.com) or me (rstevens@hgcengineering.com) and we will send you an agenda, location and call-in number. If you have a topic of technical interest you would like to see, or to present, at a Breakfast meeting, or if you would like to volunteer, please email info@awma.on.ca. Please take a moment to read the A&WMA ONTARIO SECTION 2015 Annual Business Summary. The main focus of the meeting will be to discuss the new EASR regulation and requirements, as detailed in the attached MOECC fact sheet. The chapter’s AGM took place on December 1, 2016 with a presentation on why small things matter – a discussion of the role of catalyst promotion in the reduction of VOCs from methane reaction. Our speaker, a PhD candidate from the University of Ottawa created a forum for learning and networking; something the chapter is keen on continuing to provide in 2017. The newly-elected board had its first meeting on January 4, 2017 to plan another successful year of bringing the environmental professional community together to share and learn. The Ontario Section of A&WMA held their 2016 fall monitoring conference at the Delta Inn in Waterloo this year. There was good attendance on October 25th at the 3 half day courses offered – Acoustics 101, Ambient Air Quality Monitoring, and ‘Stack Testing and Emission Monitoring’. Thank you to Rob Stevens of HGC Engineering, Steve Lamming of Amec Foster Wheeler, and Brad Bergeron and Kirk Easto of RWDI for instructing these 3 courses, respectively. This first day was followed by a near-capacity crowd attending the various sessions on October 26th. 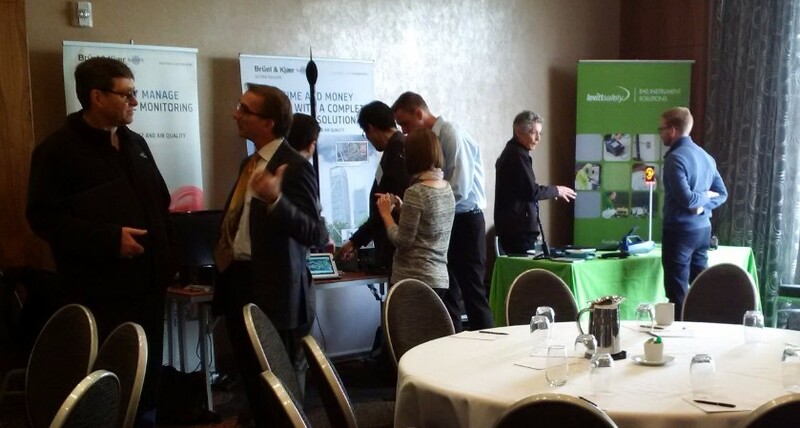 Three concurrent sessions were offered, giving attendees the opportunity to move between the various streams and select their topics of most interest. Special guest speakers from two U.S. jurisdictions spoke about sampling techniques and compliance strategies that they are seeing in the U.S. Emerging novel monitoring technologies, such as low-cost air monitoring sensors and optical remote sensing, provide unique opportunities in advancing the state of monitoring well beyond to what is currently provided by conventional monitoring technologies. But, how good are they? What are the opportunities and hurdles associated with both technologies? To answer these questions, the South Coast Air Quality Management District, the air pollution control agency in Southern California, has embarked on a broad-scale experimentation involving such technologies. The presentation will focus on lessons learned thus far and potential future applications of these technologies. His presentation covered the topics of United States Environmental Protection Agency Rules, USEPA test requirements, USEPA national stack testing guidance, the Michigan program, and more. Coffee Breaks – AGAT Labs and Enviro-Analytical. The exhibitor program was SOLD OUT! AKRULOGIC, ALS, Avensys Solutions, and included Brüel & Kjaer EMS, Inc., Dalimar Instruments, Enviro-Analytical, Levitt-Safety Limited. EHS Instrument Division’, Grimm Aerosol Canada Inc., Pacwill Environmental, Scantek Inc., Scentroid, Westech Industrial Ltd. Thank you again to the many speakers, exhibitors, sponsors, and volunteers that helped to make this a resounding success! Please send us your ideas for next year’s event. As of January 31, 2017, the MOECC will be changing the way environmental approvals are submitted and reviewed for many low risk operations. The Environmental Activity and Sector Registry, or EASR, will be available to facilities that are not found in Schedule 4 or 5 in O.Reg. 419 or in an expanded list of higher risk industries (found under the EASR Regulation). MOECC is estimating that this new approach will remove about 60% of the current applications from the standard ECA review process. Facilities that can register will still prepare ESDMs and, if required, an AAR, but rather than submitting these for MOECC review, they will be reviewed and signed by a Qualified Person (licensed engineer). The facility then registers through Service Ontario, indicating that the assessment is complete. At that point, the facility is registered and becomes exempt from requiring a Section 9 approval. The Ministry will no longer review these assessments, but will instead rely on an enhanced audit and inspection program. Practitioners will be responsible for ensuring the assessments are accurate. Licensed engineers are required to verify and sign the documents given the inherent liability and professional accountability required. As part of the new process, the Ministry will no longer approve point of impingement concentrations for contaminants without a standard. Practitioners will be responsible for ensuring the appropriate risk assessments are performed and that levels are protective of human health and the environment. The Ministry will release an updated list of standards, guidelines, and screening levels in tandem with the new EASR process that will merge the old standards and guidelines document with the jurisdictional screening level list and add or modify screening levels for some 3,500 compounds. The Practitioners will be holding a full day meeting with MOECC at Resources Road on January 24, 2017 to go over the new EASR and discuss the full requirements and implications of this new approach. The most significant noise news is the proposed changes to the Approval and Registration processes. Starting in 2017, most small and medium sized facilities will be subject to Registration rather than Approval. Requirements for preparing Acoustic Assessment Reports for new Registrations will essentially be status quo, except that the Reports will not be reviewed by the Ministry. Instead, a Qualified Practitioner must submit a declaration that the Assessment is complete and conforms to the guidelines of the Ministry. The Ministry requires that a Qualified Practitioner is a licensed Professional Engineer or holder of a Limited Engineering License from Professional Engineers Ontario. The MOECC has also released draft updates to the Primary Noise and Secondary Noise Screening protocols (“PNS” and “SNS”), proposed for release in 2017. Both will now be “Smart Form” pdf files, into which the project specifics can be entered and saved. Both have been updated for consistency with the NPC-300 noise assessment guidelines, including that neither protocol is applicable to facilities subject to a Renewable Energy Approvals or having a point of reception in a Class 4 Area. The updated PNS applies to a wider range of industries, and has increased rigor in its noise screening. Some of the minimum setback distances have changed to be consistent with NPC-300. The updated SNS does not require supplementary information such as facility description and rationale. The eligibility requirements have been consolidated at the beginning of the form, and now clarify that the SNS is not applicable to facilities with refrigerated trucks or sources of vibration. The updated SNS has introduced adjustments for large sources and source intermittency. Further detail is provided in the following MOECC Presentation. In the spring of 2017 TRA planners will begin renewing their licences. The following overview was provided by the MOECC, and further information on licensing and licence renewal is available at www.ontario.ca/page/toxic-substance-reduction-planner-licence. At least 30 credits (one hour equals one credit) must be from attending an educational course, in one of the fields of study or areas of operation listed for planner qualifications that relates to the functions of a toxic substance reduction planner and contributes to the professional knowledge and ability to perform the functions of a toxic substance reduction planner. One credit to come from each hour the planner is engaged in teaching and presentations that contribute to the professional knowledge and ability to perform the functions of a toxic substance reduction planner. Two credits for each written and published article that contributes to the professional knowledge and ability to perform the functions of a toxic substance reduction planner (up to a maximum of 10 credits). Five credits for preparing a plan or performing one or more functions of a planner (maximum five credits per plan). If a planner does not renew his / her licence on time, i.e. the licence expires, he / she will be required to retake the course and examination. A planner may request an extension of up to 90 days by contacting the ministry prior to the licence expiring. A renewal form will be sent to each planner three (3) months before their licence expires. There are currently ongoing discussions with MOECC and various stakeholder groups to determine what conferences, courses and workshops are considered acceptable. There is a lot of uncertainty surrounding around what can and cannot be considered for credits. Stay tuned for further updates. The Living List is now Live! The list of prescribed toxic substances under TRA is called the Living List. The Living List was based on discussions with academics, industry, environmental, labour and public health groups. The Living List framework describes how the MOECC will add or remove substances from the TRA list. Anyone can nominate a substance to be added, deleted or changed. Steve Thorndyke, ORTECH Consulting Inc.
What should you do if you receive an email or a phone call from an irate neighbour complaining about an odour potentially from your facility? Having a structured approach in place before complaints are made can provide a cost effective and responsive way to manage the situation. Below is a summary of a structured approach to responding to complaints. Gather Information: This means everything you can get your hands on. What day and time of day was it? Was the odour weak or strong? What direction was the wind blowing? Does your operation generate odours as a standard business process? If yes, are these odours continuous or intermittent? Were you operating at the time of the complaint? Did anything unusual happen that might release an odour at the time of the complaint (Poll your employees)? What were the weather conditions at the time (wind direction, wind speed, temperature)? Have you changed your processes or added any new activities that may generate odour? Were there any active construction sites operating nearby? Do you have neighbours that were operating at the time of the complaint and could have released an odour? Were there any other activities outside of your plant that could have contributed to the odour issue? Ontario’s Cap and Trade system is officially operating as of 2017. The first compliance period is from 2017 through 2020. In 2016, Ontario released the following new regulations and guidance documents that define the greenhouse gas reporting and trading system requirements on the Ontario Environmental Registry. The complete article is posted on the A&WMA Ontario Section blog. On June 6th, 2016 the Waste-Free Ontario Act received Royal Assent. The Act creates the Waste Diversion Transition Act (WDTA) and the Resource Recovery and Circular Economy Act (RRCEA). The WDTA and RRCEA came into force on November 30th with the goal of increasing the province’s recycling rate, which has been stalled at about 25% for the past 20 years. New regulations under the WDTA took effect on November 30th to keep Ontario’s existing recycling programs operational until they are “wound up” and new regulations put in place under the RRCEA for the collection and recycling of e-waste, used tires, household hazardous materials and Blue Box materials. Waste Diversion Ontario (WDO) has been transformed into the Resource Productivity and Recovery Authority which will monitor compliance under the province’s new waste diversion laws. The new Authority’s Board of Directors has been appointed and includes Glenda Gies, the former executive director of WDO, as the Chair. The government will spell out the new Authority’s role in greater detail by releasing a draft Transitional and Operational Agreement between the Environment Minister and the Authority. This proposed Agreement will be posted on the EBR Registry for public review and comment. The MOECC has said that it will be releasing its proposed Strategy for a Waste-Free Ontario: Building a Circular Economy “in the near future” for further consultation. This strategy will outline how the government plans to wind-up Ontario’s existing waste diversion programs and develop new regulations under the RRCEA. The province will be transitioning to a system of individual producer responsibility under this Act so as to promote competition among both producers and service providers and to allow the market to generate more effective and efficient recycling and waste reduction programs than existed under the Waste Diversion Act. The connections that link environment, energy and health are as historic and direct as the 446 bridges that crisscross Pittsburgh, the city with more bridges than anywhere else in the country. 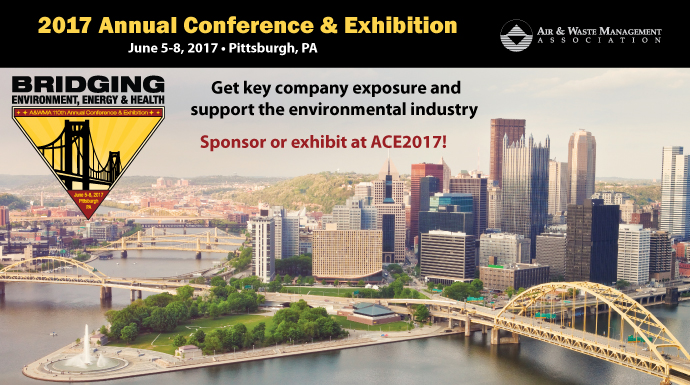 The 2017 Air & Waste Management Association's Annual Conference & Exhibition (ACE) will examine how leaders in industry, government, academia, and non-governmental citizen groups work together to improve community health and protect the environment. The Pittsburgh area is a great example of the amazing improvements in environmental quality and health that can occur when these groups are bridged together. Industry in this region has evolved to a diverse portfolio of energy suppliers, manufacturing plants, medical facilities and technology companies that are harnessing energy in sustainable and innovative ways. Come join us as we advance the science of air and waste management and recognize the many bridges to environment, energy and health. Patrick Judge, Jp2g Consultants Inc. Note: Existing members are considered "New" if they renew their membership after their renewal date. Organizational Membership is offered to companies and organizations that have more than three professionals who would like to join AWMA. Once the company or organization joins as an Organizational Member, its employees can benefit from a reduced AWMA Individual Membership cost. For example, the current Individual Membership cost is US$195, if the company or organization is an Organizational Member; the Individual Membership is reduced to US$98. Please check if your company or organization is currently on the list of Organizational Members in the Membership page of the AWMA website (http://awma.org/membership/join-a-wma) and enjoy the benefit of a reduced Individual Membership cost. Select the “Log In” button at the upper right. Enter your member number and password (or follow the password help instructions). Select “Membership” from the menu at the top of the page. Select “My Account” from the Member Services memo on the left of the page. To update your address or email address, select “Address” and “Edit” at the bottom of the “Address” page. If you have an idea for a future newsletter article please email info@awma.on.ca. Copyright © 2017 A&WMA Ontario Section, All rights reserved.